We invite you to stay at Walled Lake Lodge - a remote cabin for rent set upon a peaceful, private lake on the edge of the Pigeon River Country State Forest in Northern, Lower Michigan. Find yourself among friends and family, reconnecting, relaxing, and enjoying the great outdoors (with the convenience of plumbing, electricity and a warm bed) for a few days or week at a time. Contact us today for reservations or explore our site for more information. 6 bedrooms and 5 bathrooms - Five of the bedrooms have room for four people and one is set up for two. Additionally, there are two rollaway beds for available to use. The bedrooms are spread out in three sections of the cabin. Part One :: The master bedroom has a queen, two twins and an en suite bathroom. size bed. Two bathrooms are located at either end of the hallway. queen bed and one set of bunk beds, and the other has two twin beds and one set of bunk beds. 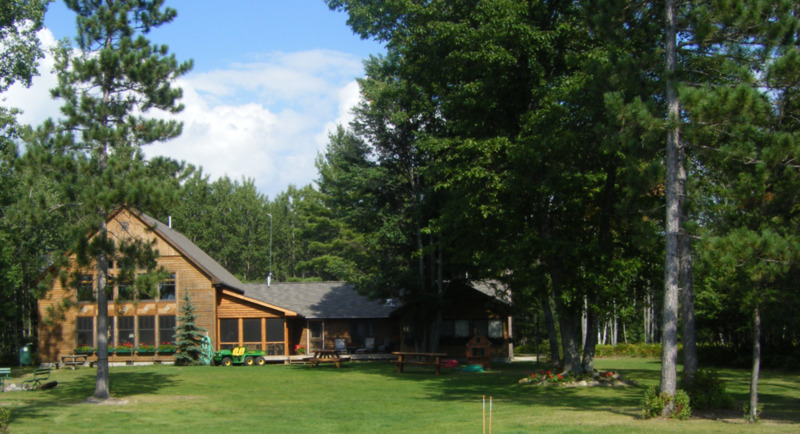 Walled Lake Lodge is surrounded by approximately 600 acres of private property. There are about 6 miles of two-track roads on the land that are perfect for drives, bike rides or walks. The lake is about 40 acres in size, 70 feet deep at its deepest point. By June it is usually warm enough for swimming and there is a raft that will be put out in the lake. There are canoes and a rowboat you are welcome to use. The lake contains mostly largemouth bass, with a few bluegills, and the occasional perch. We have a catch and release rule for using the lake, but fishing is welcome and encouraged. Additionally, there is 5,000+ feet of frontage on the Black River, which is a brook trout stream. The legal limit is 10 inches to keep fish, and if you fish for and catch some legal fish, you are welcome to keep them as it's a public river.